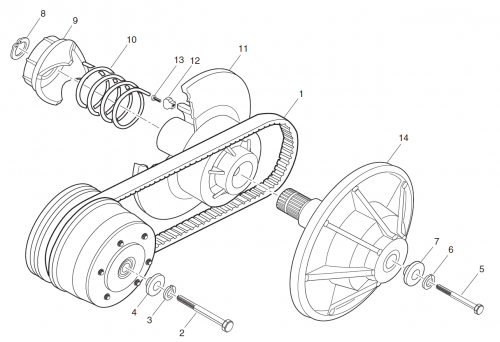 The engine deliveres power transmission to the rear axle via the Continuously Variable Transmission (CVT). 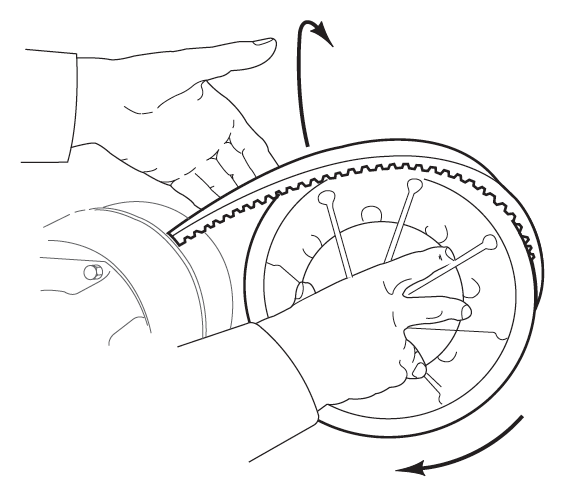 The CVT system contains two matched clutches connected with a adjoining drive belt. The centrifugal drive clutch is mounted to the engine and responds to engine RPM, whereas the reach axle contains a driven clutch. The driven clutch load senses. Remove the drive clutch from the engine. Remove the clutch from the rear axle input shaft. Take off the ramp button by taking out the screw. Replace as necessary. Refit the moveable sheave to the fixed sheave and fit the spring into the pilot hole of the moveable sheave. Fit the opposite end of the spring in the torque ramp and turn the ramp counterclockwise 140 degrees prior to engaging the splines and fitting the retaining ring. Torque the bolt to 14-17 ft. lbs. (19-23 Nm). 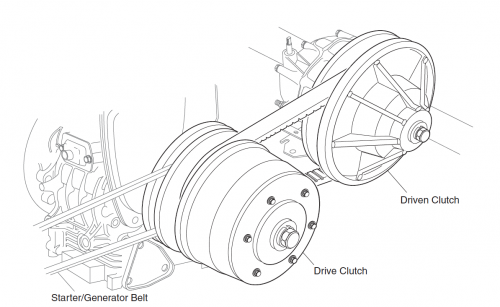 Roll the belt off the driven clutch.